Aplot is the stage name of Markus Pilz, an electronic recording artist from Graz, Austria. 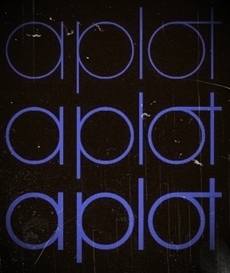 Aplot began recording in 2011 and his music contains elements of dubstep, two step, techno, ebm, glitch and electronic. A compilation released october 8th, Aplot, Girls on Drugs and many more! Sticht heraus, tut gut. Kannst dich schon mal bei Warp melden, die Welt braucht mehr solcher Musik. Schon eher bei Mille Plateaux oder raster.noton!